Lakshmi is the Goddess of prosperity and wealth and worshipped by Hindus. She is the consort of Lord Vishnu of the Hindu trinity. As per Hindu mythology, she has risen from the samudramanthan during which the ocean was churned for the pot of ambrosia.When she had arisen, her beaury captivated all the Gods but Vishnu claimed her hand and she too preferred him. She is also called Padma because of her beauty and association with the flower.Her other names include Kamala,Padmapriya,Padmamukhi,Padmakshi,Padmasundari,Jagadishwari,Vishnupriya and Ulkavahini. Goddess Lakshmi is mentioned as the daughter of Sage Bhrigu, and because of a certain curse of a sage on Indra, the Gods left heaven and Lakshmi took refuge in the ocean. She was restored with the Gods after the ocean churning or samudramanthan. Lakshmi ,9th century,LACMA collection, USA. Lakshmi is an important deity and Goddess of fortune in Jainism and Buddhism and is seen depicted at stupas and cave temples. Gajalakshmi, North torana(gateway), 1st century, Great Stupa. Sanchi, Madhya Pradesh. Dancing Lakshmi,12th century, Chennakesava Temple,Belur, Karnataka. Gajalakshmi , late 9th-early 10th century, Sandstone, Museum of Cham,Vietnam. Goddess Lakshmi is very devoted to her husband and in many depictions she is shown at his feet. She accompanied Lord Vishnu every time he descended on the earth. She was Sita to Lord Rama and Rukmini to Lord Krishna. Lakshmi is supposed to be the embodiment of all virtues. She is the divine strength of Lord Vishnu. All women are supposed to be the embodiment of Lakshmi as per Hindu belief. Vishnu and Lakshmi at Ajanta caves, 2nd Century B.C- 7th Century A.D, Maharashtra. Vishnu and Lakshmi, 12th century , chlorite, West India, Matsuoka Museum of Art,Tokyo. Goddess Lakshmi is propitiated for benefits like wealth, family dwellings, friends, good harvest , good health etc. She is worshipped alone or along with Lord Vishnu. as per the Vishnu-purana. Sri or Lakshmi is the mother of all beings and Hari or Vishnu is the father. Lord Vishnu is called Narayana. If she represents speech, Lord Vishnu is the meaning. Lord Vishnu represents understanding and she is the intellect behind it. Goddess Lakshmi’s kind gaze can transform fortunes and is much sought after. Her symbol is lotus which represents beauty, fortune and liberation and she is depicted standing or sitting on it. 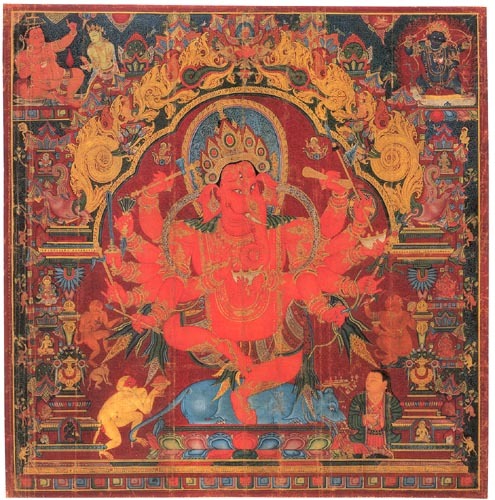 She is revered as having the energy of the Supreme Being. Lakshmi, 12th-13th century AD, granite, South India, Matsuoka Museum of Art ,Tokyo. Lakshmi’s four hands symbolise the four goals of the Hindu way of life ; dharma,kama,artha and moksha. Lakshmi’s vehicle is the owl. She is always resplendent and is showering prosperity. She signifies economic activity. Her statues have been found in Hindu temples all over South Asia. She has been depicted on coinage from ancient India. The festivals Diwali and Sharad Purnima are dedicated to her. Lakhsmi arising from the milk-ocean after the Samudramanthan or churning of the ocean,Mamallapuram, Tamil Nadu. Lakshmi with Narayana, 11th century, stone, National Museum, New Delhi. Lakshmi ,10th century,sandstone, Museum of Vietnamese History, Ho Chi Minh City. This entry was posted in Ancient Indian history, art history, asian art, diwali, Lakshmi, Lotus, sculpture of india and tagged diwali, Lakshmi, Lotus, padma on December 31, 2016 by historyreads. Ganapati is a revered deity and is worshipped by millions of Hindus across India. Known as remover of obstacles, Ganapati is offered puja at the beginning of any venture by Hindus.He is also called Ganesha, Ganaraya, Vinayaka,Vigneshwara among many other names.He is the God of intellect and wisdom. He became prominent as a deity in the 4th and 5th century. The scriptures dedicated to Ganapati are the Ganesha-purana, Mudgala-purana, Ganapati atharvashirsha, Brahmandapurana etc. Ganapati is the son of Lord Shiva and Parvati. His vehicle is the rat or mushaka. He is the Lord of the ganas; semi-divine beings who are a part of Lord Shiva’s retinue. Ganesha is the only deity with a elephant’s head. Worshipped before every new beginning and placed along with Goddess Lakhsmi in shops and other establishments; Ganapati is also addressed before embarking on a journey. Many stories exist regarding the birth of Ganapati. According to the Matsya Purana, Lord Shiva used to arrive during the bathing time of his consort Parvati, which used to annoy her. In order to stop this she is believed to have taken the oils and other ointments along with the impurities from her body she formed it into a live boy-figure by sprinkling some water from the Ganges. She kept him to be her door keeper while she was bathing. Lord Shiva arrived and wanted entry. However he was denied the same and a quarrel ensued. He got angry and cut of the boy’s head. Parvati came out and was very upset. Lord Shiva asked his attendants to get the first head that they could find to bring back the boy to life. The first head happened to be an elephant’s which was fixed on the boy’s trunk and he came back to life. This appeased Parvati and her son became Ganesha or Ganapati, the elephant headed God. Pahari painting,1750, National Museum, New Delhi. There is another mythological story regarding the birth of Ganesha. Goddess Parvati is believed to have worshipped Lord Vishnu for a son. Lord Vishnu himself came to her as a boy-child. All the Gods came to congratulate her and fixed their gaze on the child. Only God Shani did not look at the boy as he was cursed that anything he fixed his gaze upon would perish. However Parvati insisted and the moment Shani gazed upon the child, the child’s head flew off to Vaikunta. Parvati cursed Shani and was inconsolable. Lord Vishnu went in search of a head and came back with an elephant’s head. Parvati fixed it on the trunk of the child and Lord Brahma infused him with life. Another story as per the Varaha Purana, Lord Shiva himself produced Ganesha, on request of holy sages to produce a being to combat obstacles. From Lord Shiva’s countenance emerged a beautiful youth. Parvati got jealous of him and cursed him saying he will have a elephant’s head and a protruding belly. Lord Shiva blessed him saying he will be the leader of the ganas and everybody will worship him first on all occasions. Ganesha,13th century, Ramappa Temple, Warangal, Telangana. As per mythology, Parasurama came to visit Lord Shiva in Mount Kailash and was in a hurry. Ganesha did not allow him entry as Lord Shiva was sleeping. In the altercation , Parasurama cut off one of Ganesha’s tusks. Parvati came to curse Parasurama, but was stopped by Lord Brahma who assured her that her son would be worshipped by all Gods. Ganesha ,6th to 8th century , Ellora caves,Maharashtra. Ganesha in wood, early 20th century, Tamil Nadu. A Shakta manuscript cover, watercolour,gold and silver on wood, 19th century, Nepal. Ganesha with Shiva-Parvati, Kangra miniature painting, 18th century, Allahabad Museum. Parvati with Ganesha, Kalighat Painting. Ganesha is believed to be the scribe of the epic Mahabharata. Sage Vedavyasa dictated the same to him which he wrote down. Ganesha’s consorts Siddhi And Buddhi came to him by a competition with his brother Kartikeya. Both were asked to circle the entire world in order to win the maidens’hand. While Kartikeya went off on his peacock, Ganesha simply quoted from sacred literature relating to geography that he had already done the tour. Lord Ganapati’s iconic representations are many. He is shown standing, seated, crawling, dancing or on his mother’s lap. Also he is seen with two to sixteen arms in different representations. 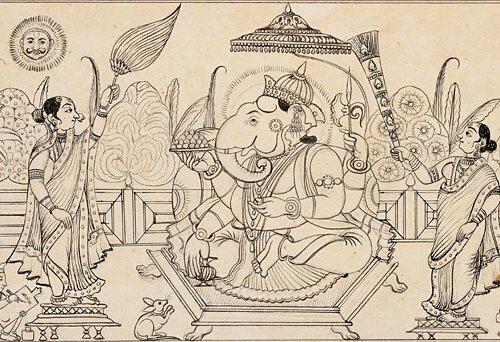 Ganesha in ink, early 19th century manuscript from Bhagavata Purana, Mysore,Karnataka. Rajasthani manuscript of Mahabharata, 17th century, Ganesha with Vedavyasa as scribe of the epic. Lord Ganesha with attendants, 16th century,City Palace, Udaipur, Rajasthan. Ganesha with ashtasiddhis , 19th century. Thomas, P./Epics,myths and legends of India, Bombay : D. B. Taraporewala and Sons. This entry was posted in Ancient Indian history, art history, ganapati, ganesha, Parvati, sculpture of india and tagged ganapati, ganesha on December 29, 2016 by historyreads. Stambha is a column with cosmic connotations, a connection between heaven and earth. Stambhas have been mentioned in early Hindu literature like the Atharvaveda. Stambhas are of different types; dhwaja stambha, kirtistambha, vijaystambha, deepastambha and the stambhas of King Ashoka. The dhwaja stambhas are placed in front of the main deity of a temple; kirti/vijay stambhas usually commemorate victories. The Ashoka pillars depict the royal edicts of King Ashoka of the Mauryan dynasty. The deepa stambhas are lit up on festival days at temples. There is a magnificent vijaystambha ot tower of victory, also referred to as kirtistambha or tower of glory at Chittorgarh Fort in Rajasthan dedicated to Lord Vishnu. Built by Rana Kumbha in 1448 to celebrate his victory over Mahmud Khilji fighting the armies of Malwa and Gujarat. The tower was designed by architect Sutradhar Jaita. The genealogy of the kings of Chittor and names of the architect and carved on the tower. The image of Padmavati, Jain Goddess is on the top story. 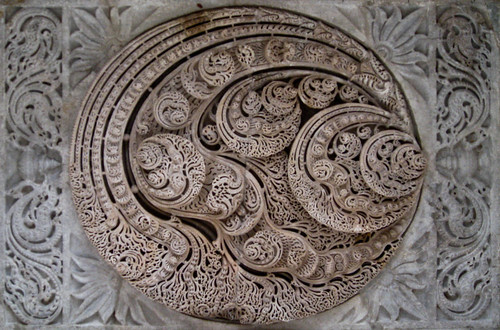 The word Allah is also carved in the third and eight stories. The Ashoka pillars were columns built by Maurya king and emperor Ashoka during 3rd century B.C. These pillars were inscribed with his edicts. Nineteen pillars still exist with the inscriptions. Six of them have lion capitals and some had the bull. The pillars weigh 50 tonnes in weight and were average 15 m in height. They were transported between large distances to their destinations. The pillars were carved out of red-white or buff-coloured sandstone, mostly at Buddhist monasteries after being brought from Chunar and Mathura. 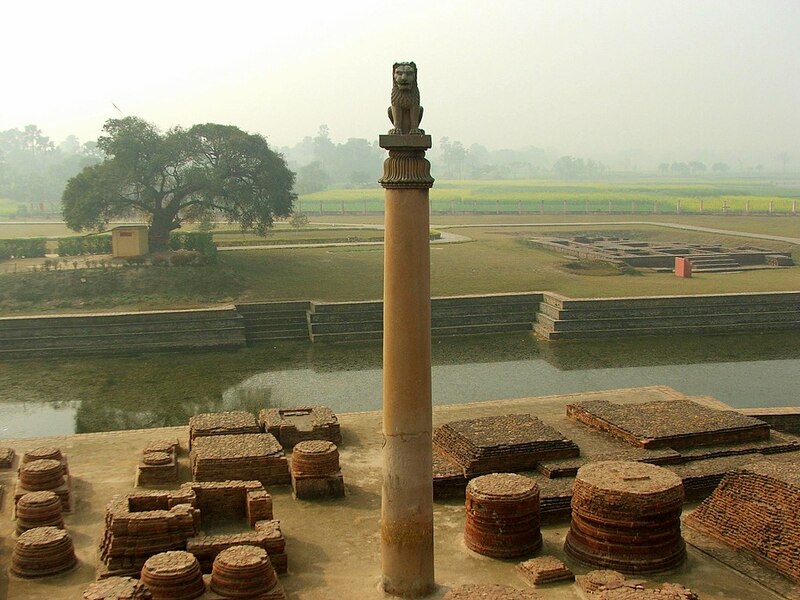 Ashoka pillar, 3rd century B.C.,Vaishali(without edict), Bihar. Ashoka pillar at Allahabad, 1870 image. Ashoka pillar with lion capital near Bhubaneshwar,3rd century B.C.,Odisha. The Ashoka pillar of 13 m height, at Ferozeshah Kotla at Delhi was originally at Topra in Ambala from where it was brought and reinstalled at Delhi by Feroze Shah. Ashoka pillar, Ferozeshah Kotla, Delhi. Vijay stambh, 15th century, Chittorgarh, Rajasthan. At the Virupaksha temple at Pattadakal in Karnataka is a victory pillar with inscriptions from the eighth century. The inscription relates the victory of Vikramaditya II of the Badami Chalukya over the Pallavas of Kanchipuram. Victory pillar with inscriptions, 8th century, Pattadakal, Karnataka. A brahma stambha stands in front of the Parsvanatha Basti on top of the Chandragiri Hill at Sravanabelogola in Karnataka’s Hassan district. The temple was built in the 11th century and is called Kamata Pasrvanatha Basti.The image of Parsvanatha stands on a lotus pedestal. Lord Parsvanatha is the 23rd Jain Tirthankara and who had an encounter with his enemy Kamata. In late 17th century a manasthambha, also referred to as Brahmastambha facing the temple, 65 feet in height was erected. The Kolaramma temple is dedicated to Goddess Parvati worshipped as Kolaramma. She is the presiding deity of Kolar in Karnataka. It was built 1000 years ago. by the Cholas. Ornately carved statues from granite stone, lend splendour to the temple which the Maharajas of Mysore used to visit regularly. The second deity at the temple is Chellamma who protects from scorpion-bites. 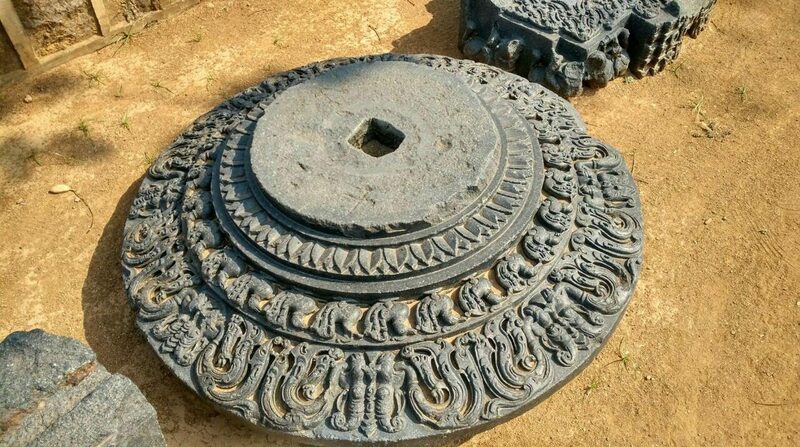 The Hundi of the temple is believed to have a large hole dug into the earth from where one can still hear the sounds of the coins collected over hundred of years. Dhwajastambha, Kolaramma temple, Kolar, Karnataka. In the Hutheesing Jain temple at Ahmedabad,Gujarat which was built in 1848 dedicated to the 15th Jain Tirthankara,Dharmanatha. Hutheesing was a rich trader who helped traders by building the temple so that they could be engaged in work during drought which lasted two years. Designed by Premchand Salat, the main building is double storied. The temple houses 11 deities and an additional 52 shrines. The temple has a manastambha or a column of honour. Deepastambha, Harsiddhi Mata Temple, Ujjain. The Shantadurga or Santeri temple near Panjim in Goa is dedicated to Goddess Shantadurga who is believed to have mediated to stop the quarrel Between Lord Shiva and Lord Vishnu of the Hindu trinity. The temple was built during the reign of King Shahu, grandson of Shivaji in the 18th century between 1713 to 1738. The temple had undergone many modifications and Neo-classical architecture can also be seen. On the left side of the courtyard is a deepastambha which is lit up with oil lamps on festival days. Deepastambha,Shantadurga temple, 18th century, Goa. This entry was posted in Ancient Indian history, art history, history of india, pillars, stambhas and tagged Ancient Indian history, Buddhist art, indian history, pillars, stambha on December 24, 2016 by historyreads. Goddess Parvati from Hinduism represents love, devotion and fertility. She is the mother goddess and is nurturing and gentle. But she has other aspects which are depicted in her 108 names. Her name is derived from the word parvata which means mountain in Sanskrit. She is the daughter of Himavat, king of the mountains. She is the consort of Lord Shiva. She was Sati reborn (who was Lord Shiva’s earlier wife and had perished due to a feud between her father Daksha and Lord Shiva). Parvati had to practice severe austerities before she could marry him. Their children are Ganesha and Kartikeya. Lakshmi, the Goddess of wealth, Saraswati, the Goddess of learning and Goddess Parvati together make up Tridevi. Along with Lord Shiva she is central to Shaivism ( a sect of Hinduism; followers of Lord Shiva) and is depicted in literature, art and sculpture all over Asia. Parvati, terracotta, Gupta period, National Museum, New Delhi,India. Goddess Parvati, Odisha, 11th century. Goddess Parvati, standing on Nandi, the bull with her children on her side, Java, Indonesia,14th century. Goddess Parvati has many other names. Haimavathi again means , daughter of Himavan. She is also called Aparna; one who took nothing to sustain herself. She is also called Shailaja, daughter of the mountains. She is Uma and Ambika, Shakti,Gauri,Kali,Shyama,Maheshwari, Durga, Bhairavi, Bhavani,Kamakshi,Annapurna and many others. She is Lalita in the Lalita sahsranama, where she has a thousand names. Goddess Parvati is referred to as a beautiful maiden.She is a Goddess in many different roles and moods. She is calm and placid,or fierce and an enemy of evil. She is fair and golden as well as dark complexioned in her many forms. Goddess Parvati, Chola bronze,13th century. Parvati is first mentioned in the.Kena upanishad as the embodiment of knowledge and the mother of the world. She reveals the supreme knowledge or Brahman to Agni, Vayu and Indra. She finds mention in the Hamsa upanishad. In the epics Ramayana and Mahabharata she is mentioned and also in the Puranas. Coins were issued depicting Uma during King Harsha’s time in ancient India. The Shiva-Parvati theme is represented in art and sculpture in many parts of India and South Asia. Many temples are dedicated to her; with her unique name and legend associated with them. Festivals like Teej and Gauri tritiya are held during the year. Lord Shiva and Goddess Parvati, Chola, 13th century. Lord Shiva and Parvati with Ravana shaking Mount Kailasa,Ellora cave No.29, Maharashtra, India. The marriage of Lord Shiva and Parvati, ivory, 18th century. Lord Shiva and Parvati on Nandi, Shiva’s vehicle,11th century. Goddess Parvati is the ideal wife and mother. In the concept of Ardhanarishwara an ideal visualisation of a couple is depicted as half man and half woman. Each is complementing the other; one being Shiva and the other Parvati. Ardhnarishwara, red mottled sandstone, Mathura, 2nd-3rd century. Epics, myths and legends of India/Thomas, P, Bombay : D.B. Taraporewala and Sons. This entry was posted in art history, asian art, hinduism, Parvati and tagged art history of India, Parvati, sculpture of india on December 17, 2016 by historyreads.